Posted on 7, January 2016 by EuropaWire PR Editors | This entry was posted in Automotive, Germany, Industrial, Technology, Transportation & Logistics and tagged autonomous driving, CES 2016, Dr. Stefan Sommer, technologies, ZF. Bookmark the permalink. Friedrichshafen/Las Vegas, 7-1-2016 — /EuropaWire/ — During its first appearance at CES in Las Vegas and using the slogan “Shaping the next decade of automated driving”, ZF will highlight its strengthened commitment to the megatrend of autonomous driving since its acquisition of TRW. The company is in a unique market position to develop and significantly accelerate automated driving functionality of the future with its leading portfolio of sensors, intelligent control units, and actuators. Automated driving requires more than just intelligent mechanics. The vehicle’s systems will also need comprehensive, precise, and reliable information about the state of the driver. During highly automated driving, where the driver will no longer have to monitor the system, he or she will remain responsible for taking back control of the vehicle at any time when prompted. Driver monitoring is therefore a critical part of the development process – and one where ZF has a solid understanding. At CES, the company will demonstrate the multi-faceted interaction between human and machine, with innovative concepts in the area of human-machine interface (HMI). Active safety systems are the basis for automated driving functions. These help protect passengers, drivers, pedestrians and other vulnerable road users in emergency situations. Active safety systems from ZF will enable automated functions in emergency situations such as automatic emergency braking or emergency steering maneuvers. The next step is geared toward highway driving, with partial and fully automated drive functions set to considerably increase safety and comfort. ZF’s long-term goal is to also increase safety in highly complex city traffic. 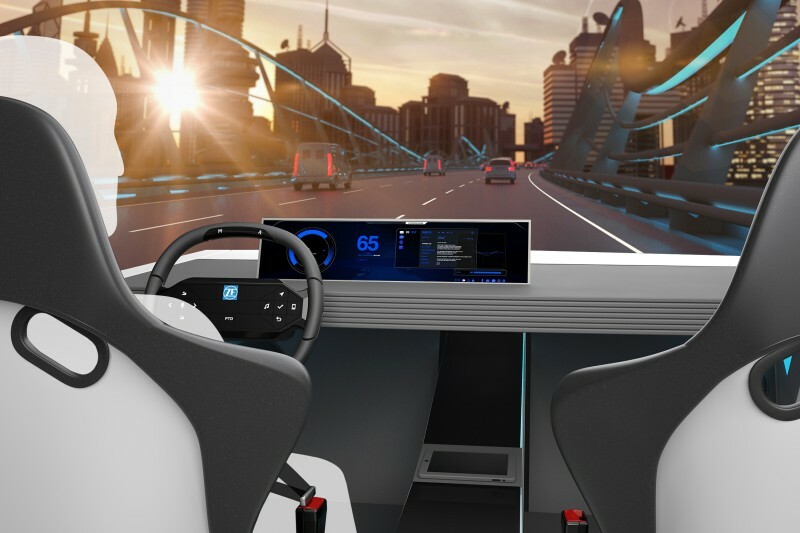 ZF believes that the initial potential of future urban mobility lies in intelligent networking, namely, interconnecting the chassis, driveline, and driver assist systems, as demonstrated in its electrically powered, cloud-connected Advanced Urban Vehicle that features partially automated functionality. This prototype vehicle represents ZF’s new competencies following its acquisition of TRW. ZF has been active in North America for almost 40 years. The technology company currently has 50 locations in this region – 34 of which are in the U.S., 12 in Mexico and four in Canada – and manufactures products for the automotive industry and other sectors. The number of ZF employees in the North American region was 30,800 at the end of 2015; and roughly 12,600 of them work for ZF in the U.S. In 2014, the company generated total sales of € 3.7 billion, with almost one-fifth of that sales (€ 18.4 billion) coming from North America (ZF Friedrichshafen AG 2014 consolidated group sales without the ZF TRW Division). After the acquisition of TRW Automotive, the sales shares from North America will be significantly higher in 2015. The ZF Concept Cockpit showcases four practical integrated innovations, including a special steering wheel with hands on/off detection, a touch display with realistic key simulation, a new, highly precise facial and emotion recognition feature, and actively responsive and communicating seat belts.